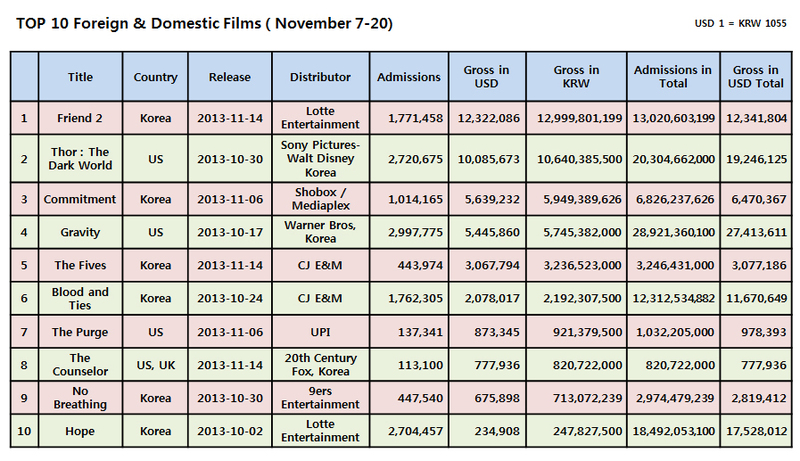 KWAK Kyung-taek’s Friend 2 is ploughing ahead at full force in the box office race. The sequel returns 12 years after the release of the original in 2001, and attracted 1.06 million admissions over its first weekend, despite the ‘Restricted’ rating it received from the Korea Media Rating Board, and topped the local box office chart against competitors such as Hollywood blockbuster Thor: The Dark World and Korean film The Fives. The total box office haul for Friend 2 now stands at 1.77 million admissions. With the collaboration of YOO Oh-seong, who starred in the critically and commercially acclaimed Friend, which attracted 8.2 million in total admissions, rising star KIM Woo-bin, who has stepped up to stardom with popular TV dramas such as School 2013, A Gentleman’s Dignity and The Heirs, and A Frozen Flower(2010) and A Better Tomorrow’s(2010) JOO Jin-mo who plays Joon-seok (played by YOO Oh-seong)’s father, Friend 2 unravels with an all new story. Friend 2 is JOO Jin-mo’s second film with filmmaker KWAK Kyung-taek since Love in 2007. Sold to the U.S., Japan and Taiwan at this year’s AFM, Friend 2 is awaiting its U.S. release early December on 20 screens. The Fives, released on the same day as Friend 2, attracted 260,000 admissions during its first week. Revenge thriller The Fives deals with the story of a woman who finds five people who will help her avenge her misfortune caused by a demonic murderer who slaughtered her family and crippled her. Based on the webtoon created by JEONG Yeon-shik who also takes the director’s seat, The Fives stars KIM Sun-A of popular TV drama My Name is KIM Sam-soon. Unfortunately, box office prospects are not so optimistic for The Fives due to fierce competition from Friend 2, which occupied 968 screens during its opening week, and Thor: The Dark World as it moved into its third week. Now playing on 491 screens, The Fives total currently stands at 440,000 admissions. 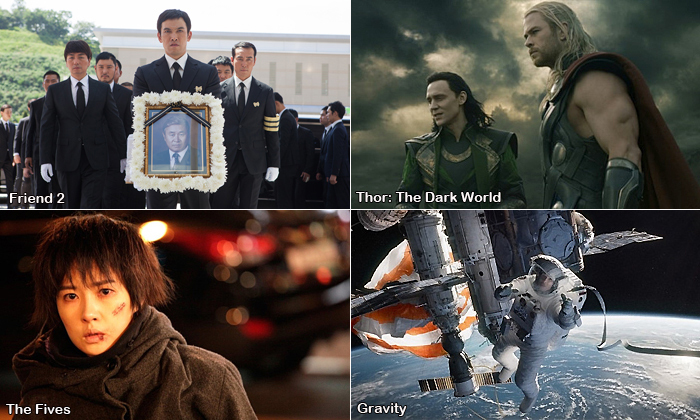 Thor: The Dark World and Gravity are in decline, each having dropped 50% in admissions. Thor: The Dark World added 340,000 weekend ticket sales during its third week and has scored 2.72 million admissions in total while Gravity, added 120,000 spectators, and has now accrued 2.99 million admissions. Meanwhile, action drama Commitment, starring Korean Wave star CHOI Seung-hyun (a.k.a. T.O.P), dropped to fifth place in the rankings as it moved into its sophomore week. Adding a weekend score of 100,000, Commitment has reached 1.01 million admissions in total. The thriller drama Blood and Ties starring SON Ye-jin added 20,000 viewers, bringing it to 1.76 million admissions in total. On the independent scene, the music documentary Black Gospel and INGtoogi: The Battle of Surpluses clearly stood out. Starring YANG Dong-keun, KIM You-mi and JUNG Jun, Black Gospel documents the journey of these three actors who set off to Manhattan, New York to learn black soul music. Released on just 143 screens, the film attracted 16,000 admissions. UM Tae-hwa’s feature debut film INGtoogi: The Battle of Surpluses clearly stood out. Released on 94 screens and attracting 4,800 viewers, INGtoogi: The Battle of Surpluses received critical acclaim as it follows the drama of violence prone Internet bullies when they meet in real life.